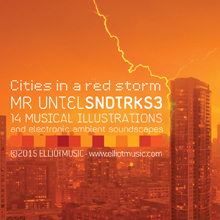 In the 14 tracks of drifting electronics, the album SNDTRKS 3 “Cities in a red storm” by Mr Untel (Gerard Langella – Didier Cremieux) offers a landscape of tweaked drum loops and electronically altered guitar sounds, creating landscapes of atmospheric dissonance and gritty synthetic edge. Ethnic instuments transport you to far away cities. SNDTRKS 3 is evocative and melancholic, time stand still as the red storm rages in. Contact us to get free promo pack today !